Guyuan Great Wall of China, location Coordinates: ???. In Ningxia Hui Autonomous Region there are five sections of outer layer of The Great Wall of China. Taken from East to West, he first of these is Yanchi County Great Wall of China. The others are Shuidonggou (Coordinates: 38° 16′ 43.09″ North, 106°31′ 53.45″ East), Dawukou also known as Jiucai Gou (Coordinates: 39° 4′7.97″North, 106°21′14.52″East), Sanguankou or Helan Pass (Coordinates: 38°20′48.72″North, 105°49′23.74″East) and Songwei or Zhongwei (Coordinates: 37°31′8.21″North, 105°10′54.41″East). After Zhongwei the main body of the Great Wall continues across the border into Gansu Province where the first option to visit is the Gantan Great Wall of China site. The Guyuan Great Wall site is the exception of the Great Wall in Ningxia Hui, as it is part of a seperate inner layer that lies more to the South. The first Guyuan Great Wall does not date to the Ming Dynasty Era (1368 AD - 1644 AD) and was not a part of the Ming Era Wall. It is part of the historical first Great Wall as constructed during the Qin Dynasty (221 BC -206 BC). Less than 2,500 kilometers (1,500 miles) remain of the 6,300 kilometer long wall that was first built in the Qin Dynasty (221-206 BC). As may be expected, nothing much remains of the Qin Dynasty Era Wall near Guyuan either. When many centuries and dynasties later, during the Ming Era the Guyuan Wall was rebuilt, to serve as an additional defense along the corridor leading from the West to Xi′An in Shaanxi Province. Guyuan is the principal town of southern Ningxia. The Town of Guyuan lies close to the Liupan Mountains. Guyuan was a significant settlement already as early as the first settlement in these regions by the Han. Under the rule of Qin Dynasty, the Ningxia plain was conquered and settled for the first time. Some of the remains left by the activities of the Qin, and other generations of early settlers that followed, can be seen at the exhibit in the town's fascinating museum (Guyuan bowuguan). Inside the Museum, several reconstructed tombs ranging from the Northern Wei Period (386 AD - 535 AD) to the Yuan (1271 AD -1368 AD) can be seen and even entered. One contained several wall murals and an army of miniature military figures, reminiscent in a smaller way of the remains at Xi'an. A large model displayed the former city with two sets of walls, ten major gate towers, a bell tower and a temple. Only a few parts of the city walls still remain. 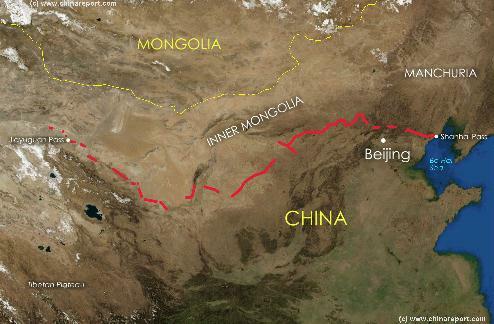 Although within the protection of the Great Wall of China, Guyuan was away from the main Silk Route from Lanzhou to Xi'an and found itself increasingly isolated as communications developed to the north and south of its valley. A century before the advent of the Yuan Dynasty Era, while China was split between the Northern Jin Dynasty and the Southern Song Dynasty, the Guyuan Great Walll became a pivotal point. It was the strategic point through which Genghis Khan′s arrmies were to smash into China after the defeat of the Xixia Western Sunrise) Empire and the final fall of the city of Kara-khoto in 1316 AD. At the time, the great offensive did not come aas Genghis Khan lay mortally wounded and succumbed. Having removed the Yuan Dynasty, the Mongolian Armies retreated through the Jiayu Pass (Jiayu Guan) in Gansu Province leaving the Ming with a bitter memory. Eventually, the strategic situation was improved by building an additional layer of Wall in the region. This was the Guyuan side-wall. During the Ming Dynasty Era an entirely new Great Wall was erected in the Guyuan area, serving as an Inner Layer of Defense along the main route into the green heartlands of China. "Chairman" Mao Zedong's brave and proud utterance "You are not a true man if you have not arrived at the Great Wall" was stated when he stood at Liupan Mountain in Ningxia and stared at the winding ancient walls below. A Full Google Earth Supported Map of Guyuan Great Wall by Google.com. Adjacent Map gives direct access to Zhongwei & Great Wall by Google. The road out of town heads north past the ruins of a former mud-walled town and the remains of a Qin Dynasty Great Wall, which is part of an Inner Defensive layer dating from the End of the Warring States Period. Guyuan City in Ningxia and finally arriving at Zhenyuan County in the southeast. This section contains platforms of from three to ten feet tall every 219 to 328 yards. The Guyuan's inner side wall is located in Mahuangshan Village and travels from Mengcheng Village southeast to Yancheng City, moving towards the boundary of Shaanxi, Gansu and Ningxia. This section is unique in its style of construction. It was built by sharpening the hills into steep cliffs and channels which are difficult to overstep. The remains of Ming's wall in Ningxia are composed of four sections: the west, the north, the east and Guyuan's inner side wall. The west wall goes along the Yellow River from Zhongwei City northeastward to Sanguankou Pass underneath Helan Mountain. The east section begins at Lingwu County, goes south to Yanchi City and ends in Dingbian County in Shaanxi Province. The north section links the west and the east sections together. The total length measures about 0.8 miles and most sections were built from yellow earth.